Environment & CSR | MAEDA SEISAKUSHO CO.,LTD. 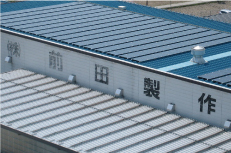 MAEDA Seisakusho Co., Ltd. has had continuing commitment to reduce impacts on the environment due to our ongoing business process, and since the year 2000 we have been certified ISO14001/Environmental Managing System. 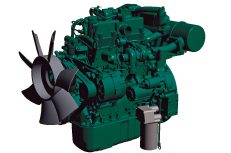 Maeda Mini Crane engines are certified to comply with EPA Tier4, CARB Tier3 (US Markets) and EU Stage IIIB & IV （European emission standards）. Both crane functions and travelling operation can be undertaken with the (optional) electric motor over and above using the engine. This is ideal for working indoors or confined spaces where gas emissions need to be negated. 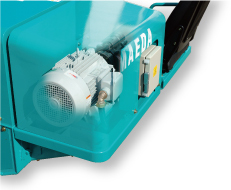 The electric motor is controlled by inverters for ultra efficient speed of rotation. Energy saving systems control motor rotation to allow energy saving when the crane is not in operation and automatically stops after a period of time. Compliant standards to current World requirements. The "Cool Biz" campaign is launched every summer to encourage our staff to dress in a more casual manor to help reduce the usage of air conditioning. Instead of wearing more formal attire such as suits, jackets and ties, we encourage polo-shirts and casual clothing. With 944 photovoltaic solar cells mounted on the roof of our factory we can generate 140kw of Green energy at maximum output. 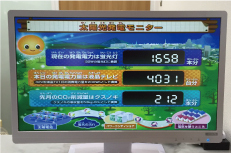 This amount of electricity would power 35 normal houses in Japan. The Maeda group companies actively encourages its group businesses and individuals within our group to ecological living practices. Me-pon is the Maeda's group original system which actively encourages its employees and their families to promote environmental activities. Points earned from Ecological action can be replaced with fair trade products and other Eco related products. Defined eco actions include three Eco commitments, Eco-Commuting, Eco volunteering activities, keeping Eco environmental housekeeping book, and getting Eco-related licensing. "Smile for All in the World"
The Maeda group companies support the "Smile for All in the World" program hosted by Japanese Overseas Cooperation Volunteers, by offering wheelchairs to developing countries such as Tanzania and El Salvador. We have donated a percentage of our profits to "Great East Japan Earthquake fund" through Japanese Red Cross. We will never forget our heartfelt emotions at the time of this tragic disaster, and will continue our support through our technology directly and indirectly. 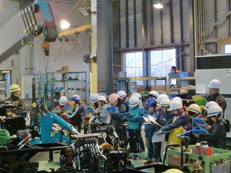 We open our facility partially and accept elementary school classes for their social study field trips. From the 11th top floor of our main building students can look down on their home town to study social activities. We also open our product facility for Mini Crane construction to allow students to learn the process of manufacturing of our mini cranes. As a volunteering activity Maeda employees patrol the neighborhood of our local elementary school when students are returning home. Maeda has been continuing this activity for many years and awarded accolades from our local community. In the summertime Maeda participates in such local events as "Binzuru" festival and the Maeda baseball team takes part in tournaments and games organized.